Standard Bunk: $595 per person; includes all meals. 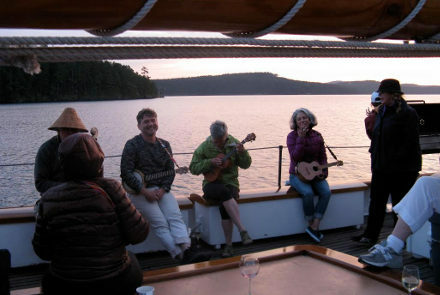 Come aboard our third annual Ukuleles at Sea! Joining us as Musical Cruise Director is Brett “2ch” Santucci, leader of the 300-strong Pluckin’ Strummers Uke Group. Brett loves helping players develop their skills and is a big believer in people enjoying the journey along the way. In addition to singing and strumming, Brett will teach us alternate strum patterns and chord positions with some music theory mixed in. He spent his youth aboard boats on Virginia’s Inter-coastal Waterways and is excited to experience the camaraderie of our Uke Group at sail. We’ll dip into some new tunes to expand our musical horizons, and bring back some of our Greatest Hits from our first two trips. Please bring your own ukulele in a case. 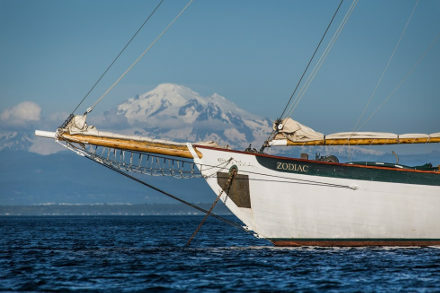 In between sailing & strumming, we’ll sample all the Schooner Zodiac has to offer, from kayaking to hiking to cocktails on deck in the summer sunset.